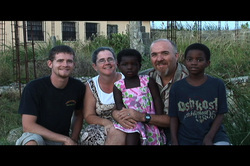 Since 1997, Keith and Cindy along with their children Tiffany (and her husband Hermelin), Daniel, Willy and soon-to-be-adopted Sabrina Nicole, have been in Haiti ministering to the Haitian people. Our vision is to raise up a generation of Fathers both spiritually and physically, so the country of Haiti will turn back to Father God, and the return of Jesus will be sweet for Haiti. Bring AOTW to your church, home school or ministry!